Executing your race warm-up requires you to balance two important skills: efficient execution and time management. 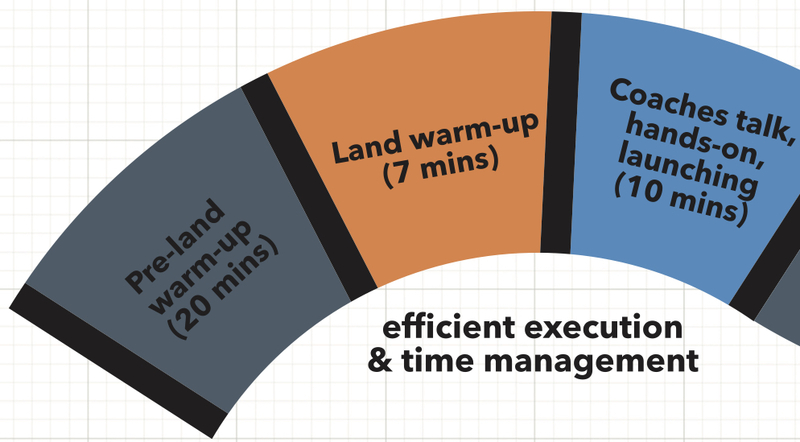 Your goal is to maximize efficiency and ensure that the warm-up is productive. You have to keep the big picture in mind, not just what you do when you're on the water. Familiarity with your warm-up and the time it takes to complete is key to ensuring things run smoothly on race day. Practice your warm-up ahead of time and discuss with your coach what you should prioritize so that your sole focus can be on getting the crew ready to race. It's your job to make sure your rowers know when the land warm-up starts . Announce the time remaining, calling twenty, ten, five, and two minute friendly warnings. This gives your rowers time to change, go to the bathroom and mentally prepare for the race. Keep everyone apprised of how much time is left so no one has an excuse for being late. This is the usual pre-practice warm-up that you do every day. This can consist of basic exercises such as elbow rotations, leg swings, squats , rotational lunges, with each one lasting for 30-60 seconds. You know your routine; give your rowers time to get it done. You've done this all before, but the amount of time it takes may vary depending on how far your boats are from the launch site and/or how long the wait is at the docks. It's in your best interest to keep an eye on the dock activity throughout the regatta. Go to the dock officials an hour or so before you expect to launch to see if they recommend arriving a little early. Don't underestimate the impact a five-minute walk or a ten-minute wait time can have on your warm-up, especially if you don't expect it. This is where your ability to be flexible and adapt is going to be tested the most. Have your race warm-up written in your notebook. You'll have this because you should be practicing your full pre-race warm-up at least once a week during the season. If not, ask your coach what they want for the race warm-up. But, make sure you also have a "Plan B" and a "Plan C" in your back pocket in case you get stuck on the water longer than intended or you have to cut the warm-up short. Plan B is what to add if you have extra time. Calling steady-state rowing with specific focus calls will help your rowers keep their head in the warm-up without taking them to the edge. Plan C is what to cut if the timing before the race gets tight. Shortening your warm-up takes forethought. Make sure you discuss with your coach what can be trimmed (typically basic drills) and what is a must-do (typically warming pieces and race starts) . For sprint races, try to get in at least one full-pressure start. For sprint races, build in five minutes to do a full start in your lane before locking onto the stake boat. Beware, you must be experienced at locking onto the stake boat to execute this part of the warm-up. If the conditions are poor or you're new to stake boats, skip this part of the warm-up. Having a calm approach to the stake boats will benefit your rowers more than doing a practice start in the lane. Locking onto the stake boats is best done slowly and calmly. Practice this skill before you get to the race course. You must be locked onto the stake boats (sprint races) or in bow-number order near the starting chute (head races) two minutes prior to the start of your race or you risk getting a warning from the race officials.